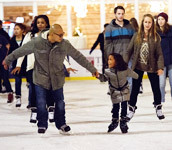 The Rothman Institute Ice Rink season is almost over! 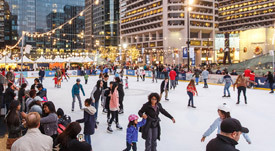 The Rothman Institute Ice Rink at Dilworth Park is offering a special thank you to all first responders on February 21. From 1-4pm, get free admission* with purchase of skate rental for up to four people and a 10% discount off menu items inside the Rothman Cabin with presentation of badge or active military ID. Enjoy community outreach, interactive activities, and entertainment, along with safety and fire prevention information for all visitors. GrubHub will have a special dining offer, just for First Responders. The Next President of the United States is... You? Experience Headed to the White House, the only exhibit of its kind, created to immerse visitors of all ages in the excitement of the election season. Join the race, earn the nomination and win the election as artifacts, interactives and hands-on activities take you from the campaign trail and into the Oval Office – all in one visit. Now through November 13. Beginning on February 17, The Academy of Natural Sciences of Drexel University will host the annual George Washington Carver Science Fair for Philadelphia schoolchildren (grades 4-6). One of the largest of its kind, the fair promotes scientific inquiry and allows students to display various projects inside the museum. The fair is dedicated to and named after the noted 19th-century botanist and inventor, George Washington Carver. Unleash your creativity in this two-part anatomical drawing and etching class. On February 20, students will create a fantastical imagined creature by drawing several specimens contained within the collections of the Mütter Museum and Historical Medical Library, taught by Meredith Sellers. The next day, February 21, students will convert their drawings into etchings at Second State Press. February 27 is the 20th Annual Human Rights Campaign (HRC) Greater Philadelphia Gala. HRC is the largest civil rights organization working to achieve equality for lesbian, gay, bisexual and transgender Americans. The Human Rights Campaign represents a force of more than 1.5 million members and supporters nationwide — all committed to making HRC's vision a reality. The archives of Eastern State Penitentiary are packed with historic treasures that the public rarely sees. From March 3-13, Eastern State presents its fourth annual Pop-Up Museum. This year's theme focuses on sports and leisure. On display will be sports paraphernalia, including a photograph of former Philadelphia baseball manager Connie Mack with warden Cornelius Burke, as well as objects depicting recreational activities – inmate-made crafts, paintings, confiscated shanks and other weapons. There will also be a 1929 short movie of sports at Eastern State Penitentiary never before been shown at the historic site.